The world's largest plane, Stratolaunch, could be just months away from its first flight. 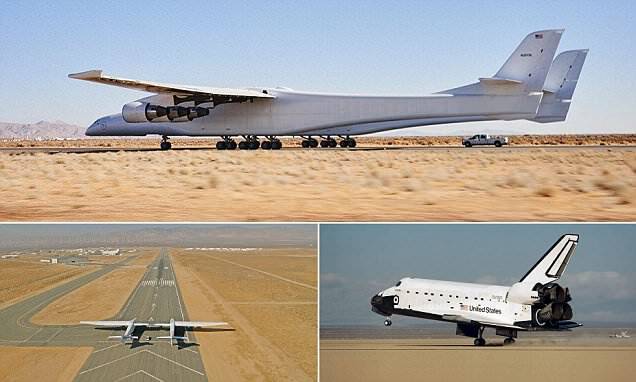 The aircraft - which is the vision of Microsoft co-founder Paul Allen - has a wingspan longer than a football field and comes equipped with two cockpits, 28 wheels and six engines normally used to power 747 jumbo jets. Eventually will be used to transport rockets carrying satellites and people into the Earth's upper atmosphere, where they will blast off into space. At the 34th Space Symposium in Colorado, Stratolaunch revealed that it hoping to conduct the monster plane's first flight this summer. It has already gone through two taxi tests in the past few months, with top speeds if 28mph (41km/h) and 46mph (74km/h). The plane still has to go through three more taxi tests before it can fly, the company said. According Engadget, Stratolaunch has to reach taxi speeds up to 80mph (128km/h) and then 138mph (222km/h) during its next tests. For comparison, typical jetliners have to go as fast as 150 to 180 mph to take off (241km/h to 190km/h). As well as sending cargo to space, the plane could be used to launch a secretive Shuttle-sized rocket codenamed 'Black Ice', according to its creator. The claims were made earlier this year by Christian Davenport, a reporter who covers the defence and space industries for the financial desk of the Washington Post. He interviewed Stratolaunch and Microsoft co-founder Paul Allen, in preparation for his upcoming book on the new space race developing between tech billionaires - including Tesla and Space X CEO Elon Musk, and Amazon and Blue Origin founder Jeff Bezos.